Richard Johnston stands next to his new DX140LCR-5. Doosan Infracore Construction Equipment America named the winner of its 2015 “Win a One-Year Lease” contest. 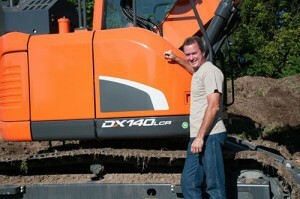 Richard Johnston, of Westville, Ind., won a one-year lease of a Doosan DX140LCR-5 reduced tail swing crawler excavator. Entrants were asked to answer the question “How can Doosan make your business stronger?” Entries were judged on the answer. Company officials said Johnston’s entry was exactly the type of essay and personal story they were looking for. Johnston, owner of Johnston Landscaping Maintenance, owns and operates a Doosan DL250-3 wheel loader, which he purchased from Ronson Equipment in Westville. He uses it year-round for various bulk material handling, land-clearing projects and snow removal. Using the one-year lease on the DX140LCR-5, Johnston will be able expand his customer base by taking on a variety of bigger landscaping projects including digging trenches, moving rocks and clearing trees, according to Doosan.